I had a small inkling that Judson Memorial Church was atypical and involved in community works. But I had no idea of the extent of this involvement nor the radical nature of the social programs it has supported. In fact, I am puzzles as to how some of the causes they have supported are even congruent with the tenets of the Protestant Church. Christian churches do have a history of outreach and social programs but Judson really takes it much further in unexpected directions. Founded in 1890 by Baptist preacher Edward Judson, the church was established form the beginning to serve the growing immigrant community in lower Manhattan (the Church is located on Washington Square South immersed in the NYU "campus"). They ran a free medical/dental clinic and a settlement house, at 179 Sullivan Street. At times they allowed homeless men to sleep on their pews. Beginning in the mid-1960s, Moody and associate minister and composer Al Carmines (1962-81) brought Judson first a city-wide and then a national reputation, opening the church to experimental, avant-garde artists from many genres: dance, painting, theatre. They have organized politically around issues of civil rights, free expression, abortion rights, and the decriminalization of prostitution (in the 1970s they established a Professional Women's Clinic for women engaged in prostitution). Judson Church trains future clergy in public ministry and has taken a leading role in the New Sanctuary Movement for immigrant rights. They are "gay-friendly." Regarding the quote currently displayed outside the church. Voltaire was a major figure in the French Enlightenment and his works are a huge subject matter - he was a prolific writer, having penned over 20,000 letters and over 2,000 books and pamphlets. He took many controversial positions and was exiled from France a number of times. Voltaire distrusted democracy, which he saw as propagating the idiocy of the masses. Voltaire is often mistaken as an atheist - some attribute this view to a quote from one of his poems that translates: "If God did not exist, it would be necessary to invent Him." Actually Voltaire was a leading Deist - his criticisms were more of organized religions than of religion itself. 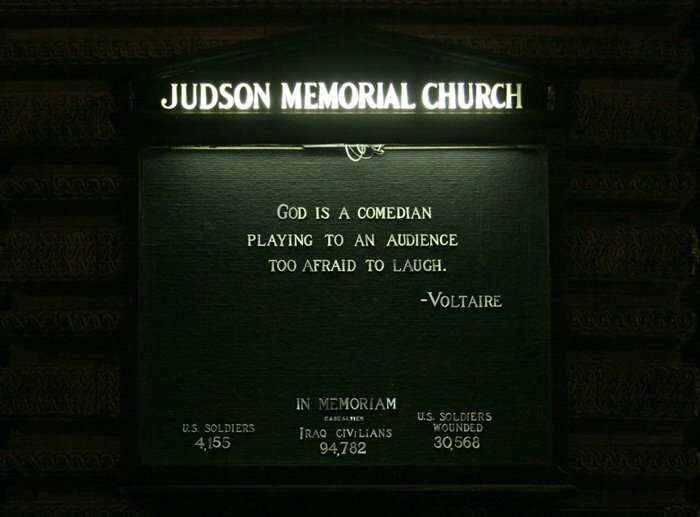 I'm not being evasive but space on this blog does not allow for a proper distillation of the various thoughts about Voltaire's quote "God is a comedian playing to an audience too afraid to laugh." Suffice it to say that many feel it has been misinterpreted and taken too literally. Any theologians or philosophers who want to posit an interpretation of God's sense of humor?